Summary of today’s show: Fr. David Cavanagh reveals to Scot and Fr. Chris how he came to be a priest of Opus Dei as a hockey player at Harvard, a little more about what Opus Dei is about, and his work as postulator for the cause of canonization of Fr. Joseph Muzquiz, an Opus Dei priest who ministered and died in Boston. 1st segment: Fr. Chris had the St. John’s seminary alumni gathering this past weekend and over 100 priests were there along with Cardinal Seán and Bishops Kennedy and Uglietto. It’s good for the seminarians to see the men already in service and for the priests to be inspired by the young men coming to help them. They gathered at 5pm for a holy hour then a cocktail hour and dinner. One of the fourth-year men gives a presentation to welcome these men home. Two seminarians also provided musical entertainment on the flute and violin and Irish music. Last night, Fr. Chris visited Norfolk state prison and the inmates were excited to hear that today’s guests is a priest of Opus Dei. 2nd segment: Scot and Fr. Chris welcomed Fr. David Cavanagh who is based at the Elmbrook Center in Harvard Square. He is in the Pastoral Center today for Fr. Joseph Muzquiz’s cause for canonization, but first Scot asked him about growing up in the area. Fr. David and his brother Joe went to Harvard as hockey players, partying as hard as they studied. They met the priests at the Elmbrook Center at Harvard and they were attracted by the fact that they never were told that there was anything wrong with playing hockey. They were told to do it well, which meant that if you’re going to do it well, then do it all for the Lord. It was appealing because it wasn’t pulling them out of what they loved to do. Scot said Opus Dei calls us to holiness in our everyday life, whatever we do every day. There is a path to holiness in every secondary or particular vocations. Unless you find God in the every day, you’ll never find him, said St. Josemaria Escriva. God blesses and uses our everyday experiences to spread the Gospel. Fr. David said his brother later reflected that it was obvious the reason they were good at hockey was so they could end up where they did in life. Fr. David had been intending to be married and it was only at the end of law school that someone asked him if God was calling him to celibacy within the apostolate as a layman. Suddenly, so much became clear and he knew it was true. Later, some of the men living as a numerary, as a celibate within Opus Dei, are called to priesthood. Fr. Chris asked Fr. David about his primary work. Fr. David said he celebrates the sacraments first and everything flows from that. He makes himself available for that. He spends a lot of time hearing confessions, giving spiritual direction to everyone, whether or not they are Opus Dei. He also preaches on retreats. Scot said he thinks of other groups within the Church, like the Franciscans at Arch Street, he thinks of the particular gifts they provide to the Archdiocese. For Opus Dei, he thinks of the help they give to people through spiritual direction, taking their faith to the next level. He helps people to see God’s signs that He provides for them and helps them to see what they might have missed. He had a strong temperament and he had to learn how to use it for the good. If all of his gifts were left undirected, he could have gone down a very different path. If we put it all at God’s service, he will direct it all to the good and show us how he wants us to use them for his glory. Scot noted how broad and diverse the members of Opus Dei are. It’s almost a response to the idea that faithful practice of Catholicism is only for priests and religious. The retreats offered by Opus Dei for men and women and young people at Arnold Hall in Pembroke are open to all, not just Opus Dei. They are open to college students and teens and priests as well. The website has much information about the retreats and programs. 3rd segment: Fr. David is postulator of the cause of canonization for Fr. Joseph Muzquiz here in Boston. Fr. David knew Fr. 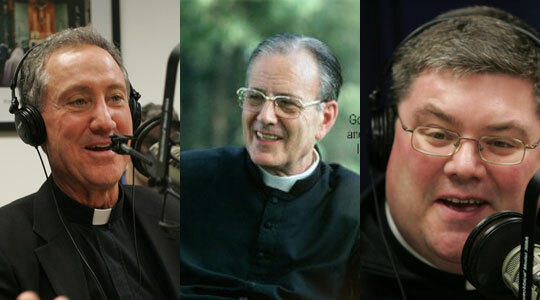 Muzquiz who was sent to the US from Spain in 1949 as the first priests of Opus Dei in this country. They cam with nothing, not even knowledge of English. He went back to Rome in 1961, having solidly established it. He later returned to the US in 1976 to head up Opus Dei until 1980 and then did pastoral work in Boston until he died in 1983. Fr. David met him in 1976. He learned later that when Fr. Muzquiz came back to Boston he was the one who asked why no one had asked him if he’d considered celibacy. Fr. David went to Rome to study in 1982 and that was the last time he saw him. When you were in his presence, he was so absorbed in you, that’s what stood out. Scot said that seems to be held in common among many saints, including Mother Teresa and John Paul. They would be totally absorbed in the person they were with in the moment. It must be like the way the Heavenly Father would be with us, but on an infinitely smaller scale. What about Fr. Muzquiz showed he practiced heroic virtues in the everyday things of his life. Fr. David said his holiness isn’t because he was a priest or one of the first Opus Dei priests in this country. Holiness is the willingness one moment at a time to speak to God with my deeds and actions and where he’s put me to let him work through me. the saints help us to lead us through the moments of history to see the reality of the presence of God that is beneath everything. Fr. Chris said what Fr. David has learned that helped him personally in this process. Fr. David said seeing the humble struggle of Fr. Muzquiz helps you focus on the freedom we have to “let it be done unto us” as opposed to trying to have control of everything. Fr. Chris said in the Cathedral in Los Angeles he is struck by the tapestries that show the saints as real, living human beings and it recalls for us that each of us is called to be a saint. Seeing a contemporary of ours being considered for these honors recalls the richness of the spiritual and its call to holiness for ordinary men and women like us. Fr. David said we all have our own gifts and Fr. Muzquiz had a tremendous capacity for work, but the beautiful thing was that he never imposed that same driven sense of work on others. He was solicitous of the situation of others and never demanded others work like him. Scot said many saints had strong personalities. What were the strong elements of Fr. Muzquiz’s personality that makes you say he was a real guy and a real good priest and that’s what made him such an example. Fr. David said when you were with him, he would give simple advice. He wasn’t a gifted preacher, but what he said stuck with you afterwards. You would be tempted to say, “I know this” until you tried to live it and realized how hard it was. He was someone who knew the Lord very well and had immense trust in the Lord in even difficult situations. He spent a lot of time making himself available to priests without imposing, but being of service to them. Fr. Chris asked if there were points in Fr. Muzquiz life where he embraced the suffering of the cross. Fr. David said it wasn’t in big dramatic things, but like most of us in the martyrdom of one day at a time. It emerges like a mosaic of his life across the decades. He was reliable in all of these things because he operated of love, not because was particularly fastidious or punctual. 4th segment: Scot asked Fr. David about the different stages of canonization. Fr. Muzquiz is now a Servant of God. Fr. David said it begins with people approaching the local bishop to ask if this person’s life is worth investigating. Then the diocese has a preliminary look at whether the persona has reputation for sanctity and whether the person’s intercession was efficacious and whether holding them up for canonization would advance the mission of the Church. If so, they submit a petition for an official cause. Once that permission is received, the person is called a Servant of God. Now they take testimony of eyewitness, people who actually knew him. This all occurs as the diocesan phase. The Tribunal hears this testimony. Then the postulator writes a biography, annotated to the record prepared with thousands of pages of documentation and the person’s writings. This biography, called the positio, and all the evidence is sent to Rome to the Congregation for the Causes of Saints. He would be declared Venerable if he’s determined to have lived a life of heroic virtue. To be beatified, there has to be a first-class miracle. This is God speaking, compared to all that is previous which is the voice of the people. To be a miracle, there is no human explanation possible for this. many doctors say that when they go to Rome to testify to a miracle, they have never faced a cross-examination like it. To be canonized, there must be a second first-class miracle. Scot said even if it’s a miraculous healing, but there could be a scientific explanation, that’s not enough. This is why people are encouraged to pray to those who are in the process. Fr. David said people should pray to Fr. Muzquiz because we can see his hand moving in the ordinary things of life. If God is willing to show Fr. Muzquiz as an example, then it’s a win-win. If people believe they have a miracle through Fr. Muzquiz’s intercession, they can email Cavanaghd@aol.com. Fr. David also encouraged people to download Fr. Muzquiz’s prayer card from the home page of Opus Dei.